10th Anniversary Special Edition, includes Matte Nebula Gray paint, blue Brembo® brake calipers, polished black 19-inch BBS forged wheels, Michelin Pilot Super Sport tires, Bespoke Fuji Blue leather trim on the steering wheel, seats, instrument panel hood and shifter, blue carbon trim on the doors, blue front seat belts, a white center marker stripe on the steering wheel, an embossed headliner and “F” logo side mirror projector lamps. Limited to 240 vehicles available for sale in the U.S. Already one of the most recognizable performance cars on the road, the Lexus RC F coupe adds yet another new look this year to celebrate the 10th anniversary of “F” performance. 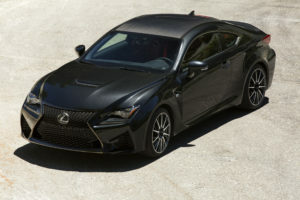 Limited to 240 vehicles available for sale in the U.S., the 2019 RC F 10th Anniversary Special Edition has the look of a true exotic thanks to its eye-catching Matte Nebula Gray paint, the brand’s first use of matte paint on a production model since the legendary Lexus LFA went out of production in 2012. Standing in contrast to the flat gray paint is a set of polished black 19-inch BBS® forged wheels and blue Brembo® brake calipers. It’s a combination of colors and finishes that make a powerful statement rivaled only by the 467 horsepower V8 under the hood. Owners of the RC F 10th Anniversary Special Edition will be reminded that they’re driving something special every time they slip behind the wheel thanks to the Bespoke Fuji Blue interior trim. The distinctive blue color is applied to the seats, steering wheel, front seat belts, instrument panel cover, shifter and center console. The steering wheel also gets a white marker stripe at the top of the rim to give drivers a reference point during aggressive driving. The final flourish inside the RC F 10th Anniversary Edition is blue carbon fiber trim on the doors and center console. 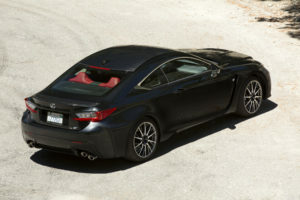 The RC F sits slightly lower and wider than the RC coupe on which it is based and features wider wheels and tires. The signature Lexus spindle grille gets a black mesh treatment that uses the “F” motif repeated in the pattern. The RC F’s stacked exhaust tailpipes leave a memorable parting visual to go along with the unmistakable sonic signature of the normally-aspirated V8. The exterior design features have a positive aerodynamic benefit—all the intake and outlet ducts are functional, helping to cool the brakes and vent the engine compartment. The air outlets on the hood and fenders not only exhaust hot air, but also help to smooth the airflow as it moves toward the rear of the vehicle. The RC F pierces the dark with standard LED headlamps and separate L-themed daytime running lamps (DRLs). Available Premium Triple Beam LED headlamps give the RC F an even more striking light signature while the rear combination lamps also have a distinct Lexus L-shape motif. 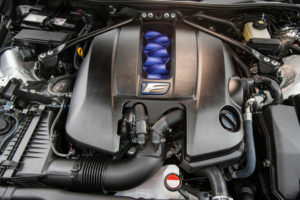 The high-performance, naturally aspirated 5.0-liter V8 is engineered for low weight and high strength with forged connecting rods and titanium intake and exhaust valves that allow a 7,300-rpm redline. Add optimized intake and exhaust manifolds to the mix and the result is an engine that delivers 467 horsepower and 389 lb.-ft. of peak torque. The high-pressure D-4S direct injection system, which also uses port fuel injectors, allows a high compression ratio (12.3:1) for optimized performance and efficiency. Variable Valve Timing (VVT-iE) enables the engine to operate in the Atkinson cycle at cruising speeds for optimal efficiency and can switch to the Otto cycle for higher performance when accelerating. The V8 sounds scintillating through the Lexus F trademark stacked tailpipes. The special exhaust system emits a rumbling baritone note, and Active Sound Control (ASC) electronically “boosts” the sound in the cabin via the audio speakers. The eight-speed Sport Direct Shift (SPDS) automatic transmission is the high-performance V8’s ideal dance partner, offering ultra-quick shifts, excellent drivability and linear acceleration. Lexus G force Artificial Intelligence Shift control (G AI-SHIFT) enhances performance by selecting the most suitable gear for sporty driving by monitoring numerous vehicle sensors. The G AI-SHIFT system also blips the throttle on downshifts to match revs and ensure smooth transitions on deceleration. Using the Drive Mode Select feature, the RC F driver can set vehicle performance responses according to the driving situation – or the driver’s mood. NORMAL mode provides the smoothest, most balanced ride quality and drivetrain performance. SPORT S adjusts the throttle settings to sharpen the engine’s responses. SPORT S+ extracts the most from the powertrain and sets the Electric Power Steering (EPS) steering assist for the greatest degree of driving feel. ECO mode helps to enhance fuel efficiency by optimizing the throttle, engine tuning and climate control system. Custom mode can also be selected by pressing the dial switch once when in Normal mode to provide a combination of vehicle settings. The RC F earned its handling pedigree from development on the world’s most demanding race circuits, including Fuji Speedway in Japan and the legendary Nürburgring in Germany. Starting with the ultra-high-rigidity RC platform, Lexus developed a special chassis for the RC F, including a strut tower brace and a substantial V-shaped rear-partition brace. A cowl brace connects the front pillar section and apron member, enhancing steering response and roll feel. Rear suspension member mounts are strengthened to help ensure maximum traction. Featuring a linear solenoid design, the RC F’s Linear Adaptive Variable Suspension (F-AVS) was tuned to improve cornering and body roll stability. In addition to consistent handling, F-AVS also enhances ride smoothness during acceleration and deceleration. The first thing RC F drivers will feel from the electric power-assisted rack and pinion steering is precise feedback from the tires. A damper-less intermediate shaft increases steering rigidity and ensures high responsiveness to steering input. The Lexus RC F offers three 19-inch wheel choices, all made from forged aluminum for optimum rigidity and minimum weight. 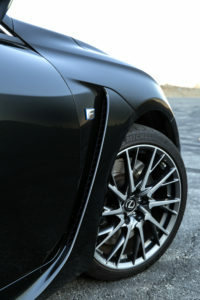 The RC F uses a staggered wheel and tire setup, with 255/35R19 front tires and 275/35R19 rear tires. Track performance is enhanced by a standard TORSEN® limited slip differential while an optional Torque Vectoring Differential (TVD) is available for those who want maximum control. The available Torque Vectoring Differential (TVD) is one serous piece of hardware, operated with help from highly advanced software. The TVD enhances dynamic performance by precisely controlling rear wheel torque. Using high-response compact motors, a planetary gear instantaneously changes left-right torque distribution through the engagement of a multi-plate clutch. It operates as quickly as 1/1000th of a second based on data including throttle input, braking, yaw rate, longitudinal and lateral G-force and other parameters. Using a switch on the center console, the driver can select one of three distinct settings for the TVD to best suit their driving style or conditions: STANDARD delivers a high level of control and agility for everyday driving; SLALOM places additional emphasis on steering response, giving the vehicle a more agile character akin to one with a smaller wheelbase, and TRACK enhances high-speed handling. Lexus Vehicle Integrated Dynamics Management (VDIM) integrates the ABS, Vehicle Stability Control (VSC) and traction control (TRAC) functions to provide proactive, seamless control of basic vehicle performance. 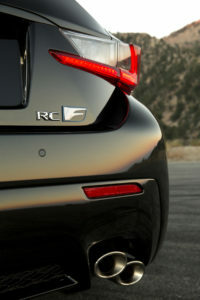 The RC F’s VDIM system features SPORT and EXPERT modes. SPORT mode gives priority to driver control. This mode offers greater enjoyment for track driving, applying optimum VSC/TRAC mapping. EXPERT mode puts even more control in the driver’s hands, turning off TRAC, but still using VSC to control the engine and brakes to assist the driver. For the RC F, VDIM is also capable of two brake control functions to the TVD control: drive-force distribution and yaw moment control. VDIM controls the torque transfer co-operatively with the TVD, for more seamless control during aggressive cornering. 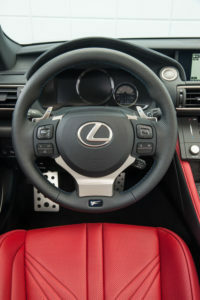 Lexus designed the RC F cockpit to offer generous seat position adjustment range and seats that conform to the occupants’ physiques. 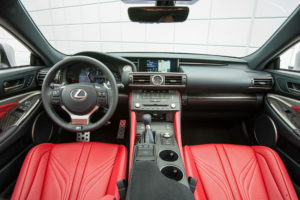 For design inspiration, Lexus again turned to its LFA supercar and equipped the RC F with unique gauges, steering wheel, seats, trim and pedals. The RC F’s exclusive small-diameter (14.6 inch) three-spoke steering wheel has a thick rim with built-in finger rests and provides easy access to the large paddle shifters. Lexus designed the RC F’s high-back front seats for track driving, yet they also provide outstanding everyday comfort. Special integrated foaming construction helps the seats conform to the occupant’s body. For maximum vehicle rigidity, the RC F has a stationary rear seatback but provides a trunk pass-through for carrying longer items, such as snowboards or skis. The Brembo® brakes feature lightweight, 6-piston aluminum monoblock front calipers with 15.0 x 1.3-in. ventilated rotors and 4-piston aluminum monoblock rear calipers with 13.6 x 1.1-in. ventilated rotors. Bright orange-painted front and rear calipers emblazoned with the Lexus “F” logo are available as an option. The Lexus RC F revives the true meaning of “instrument panel” with a control center featuring cutting edge electronic displays. 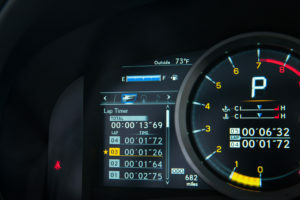 The unique TFT display tachometer, surrounded by a large-diameter machined aluminum ring, is the central gauge in the display — but it’s not always a tachometer. The meter display changes according to driving mode (Eco, Normal/Custom, Sport S and Sport S+), designed to provide pertinent information in an instant. For example, in SPORT S+ mode, the dial indicator is replaced by a bar type tachometer, which makes engine rpm more easily visible even when the meter cannot be viewed directly. In addition to the vehicle speed and shift position, the meter display shows water and oil temperatures. The panel offers other systems for enthusiast drivers, including a lap timer function, G-force display, torque distribution display (for cars equipped with the Torque Vectoring Differential) and active rear wing status. Additionally, this in-dash display offers multimedia integration, allowing the occupants to view incoming calls, current song titles and more at a glance. The Remote Touchpad uses smartphone-like touch gestures — including tap, flick and pinch — to operate audio, navigation or system information displayed on the center screen, without the user having to look down. Moving a finger over the touchpad surface moves the cursor, and pressing down or double tapping enters the selection. An integrated feedback function vibrates the surface when the cursor on the electro multi-vision navigation (EMVN) screen moves over a button. Both the standard and optional RC F audio systems play all popular digital formats, whether from a USB, or other device. Both also integrate new audio restoration technology that was introduced in high-end home systems. The technology restores some of the clarity lost during compression for digital formats commonly used today. The standard audio system drives its 10 speakers – including a 10-inch subwoofer—with 256 watts total output. The available Mark Levinson 17-speaker system creates a stunning 360-degree, three-dimensional sonic space with 835 watts of total power while consuming less energy than other systems of similar output. Even the control panel was designed to resemble the simple designs used on Mark Levinson home equipment. Lexus Enform Safety Connect is complimentary for the first 10 years of ownership with access to Lexus Enform response centers 24/7/365. Another helpful feature is Lexus Enform Service Connect which is also complimentary for the first 10 years of ownership. It allows the RC F to send alerts for specific factory recommended maintenance. The Lexus Drivers mobile app or LexusDrivers.com website can be used to set push-reminders and alerts for maintenance and service issues. With Lexus Enform Remote (one-year trial subscription included), the customer can remotely view and control certain aspects of the RC F using a smartphone, smartwatch or Amazon Alexa-enabled devices at home. The available functions include: remote door lock/unlock, remote start/stop for the engine and climate control, vehicle finder, guest driver monitor and more. Vehicles with navigation also get Lexus Enform Destination Assist (complimentary for one year) which acts as an in-vehicle personal concierge, providing directions and destinations delivered by a live agent and subscription-free Lexus Enform App Suite 2.0. All the features of the Lexus Safety System+ comes standard including the Pre-Collision System (PCS), Lane Departure Alert (LDA) with Steering Assist, Intelligent High Beam (IHB) and High-Speed Dynamic Radar Cruise Control. The Lexus RC F has eight airbags, including a dual-stage driver’s airbag, dual-stage and dual -chamber front passenger airbag, driver’s and passenger’s knee airbags, front-seat side airbags and first and second row side curtain airbags. Black NuLuxe interior with “F” logo embroidered on all four headrests. Lexus Enform Remote (one-year trial subscription included) mobile app lets you lock and unlock doors, start the engine and climate controls, check the fuel level, and more all through your smartphone, smartwatch or Amazon Alexa–enabled devices at home. Lexus Enform Service Connect (complimentary 10-year subscription now included), enables the GS F to send vehicle alerts and factory recommended maintenance alerts, simultaneously alerting a preferred Lexus retailer if opted-in. Lexus Enform App Suite app offer access to favorite mobile applications through the vehicle’s center console display, including iHeartRadio, Slacker and Yelp (Navigation equipped). New Dynamic Navigation (complimentary for up to three years) offers three enhanced features: greater accuracy through continuous cloud-based updates with Dynamic Map; alternative routes based on conditions ahead via Dynamic Route and Dynamic Points of Interest (POI), which automatically sorts POI results based on relevance; and, search the cloud using conversational speech for addresses or POIs via Dynamic Voice Recognition system. The Lexus Enform App Suite 2.0 app offer access to favorite mobile applications through the vehicle’s center console display, including Amazon Alexa compatibility, NPR One, Pandora®, iHeartRadio, Slacker and Yelp. Lexus Enform Wi-Fi allows up to five devices to be connected via the vehicle’s 4G LTE service powered by Verizon, and a 4 GB complimentary trial is offered. Lexus Enform Service Connect (complimentary 10-year subscription included), enables the RC F to send vehicle alerts and factory recommended maintenance alerts, simultaneously alerting a preferred Lexus retailer if opted-in. Complimentary for the first ten years, Lexus Enform Safety Connect includes an Emergency Assistance Button (SOS), Roadside Assistance, Automatic Collision Notification, and Stolen Vehicle Notification. The Lexus Enform response center operates 24/7/365. Lexus Enform Destination Assist (complimentary for one year) acts as an in-vehicle personal concierge.